The Hyundai HY9000LEK-LPG is a single phase, open frame dual fuel LPG/petrol generator which produces an impressive 6.6kW (Max). Powered by a 15hp Hyundai IC425 engine, the HY9000LEK-LPG is designed for heavy duty work and is more than suitable for use on construction sites and industrial environments. 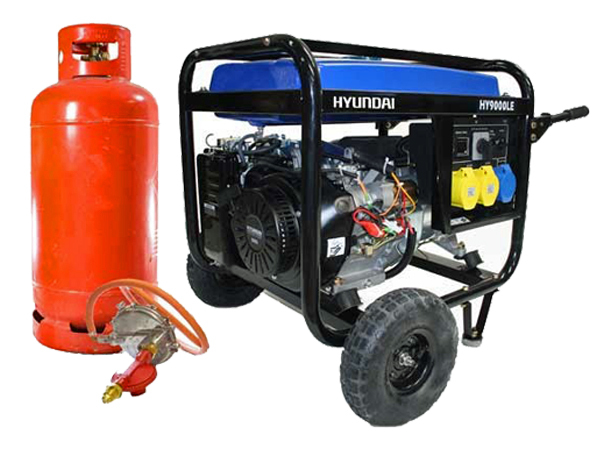 The LPG conversion also means this generator is ideal for outdoor events, catering vans and areas where petrol is sometimes restricted. With a large 22L petrol fuel tank, the HY9000LEK-LPG is able to run for up to 15 hours before refuelling is required depending on the load applied (Petrol). This is a massive convenience for users who require the machine to perform for hours at a time during the working day. One of the standout features of this dual fuel generator is the digital display panel which provides important information on the performance of the generator, including the voltage output, Hertz and hour usage. As with other petrol generators in the Hyundai Power Equipment range, the HY9000LEK-LPG benefits from the option of recoil pull and electric start functions, leaving the user in control of how they wish to operate the generator.